FORMER West Indies fast bowler Tony Gray said the region is experiencing an "explosion" of fast bowling talent, after seeing the regional side demolish England twice and clinch the three-match test series. West Indies won the second Test last Saturday by ten wickets at the Sir Vivian Richards Cricket Ground in Antigua. They won the 1st Test by 381 runs in Barbados. Gray said West Indies must ensure that we continue to develop our fast bowlers for years to come. The regional pace quartet Kemar Roach, Shannon Gabriel, Jason Holder and Alzarri Joseph have all had moments of brilliance in the series in which England batsmen have looked vulnerable to pace and bounce. Three of the Windies pacers are now ranked in the top 12 in the International Cricket Council (ICC) rankings. Holder, the number one-ranked all-rounder in the world, jumped four spots in the bowlers rankings and now lies on a career-best sixth place. The Windies captain also reached 778 rating points – the highest by a West Indies bowler since legendary speedster Courtney Walsh retired 18 years ago. 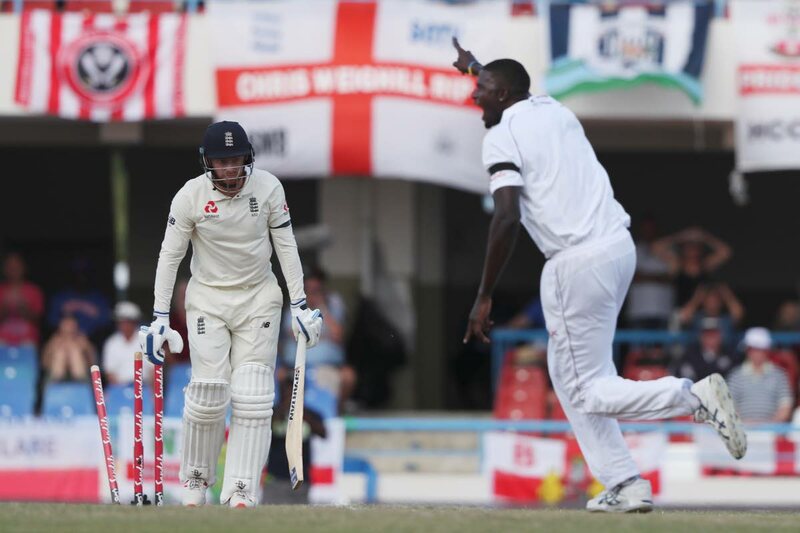 Holder followed up his unbeaten double century in the first Test in Bridgetown with an outstanding performance with the ball in the second innings of the second Test in Antigua. It was his spell after lunch that broke the backbone of the England batting and helped send them crashing for 132 all out in their second innings. He finished with four wickets while Roach, who destroyed the middle and lower order, also claimed four to end with an eight-wicket match haul. That performance saw Roach leap eight spots in the rankings to 12th just behind new-ball partner Shannon Gabriel who rose one spot to 11th. Gray said yesterday, "I think it is absolutely fantastic, because what you are not doing is depending on one or two bowlers." Gray, who played five Tests and 26 ODIs in the 1980s, said what excites him about the West Indies pacers is that each brings different skills to the team. "You have Kemar Roach who swings the ball, he has gotten a lot more consistent now and he can bowl around the wicket and against the left-handers – he is brilliant and a handful. You have Shannon Gabriel with his pace and hostility and I think a lot of the world's batsmen are sceptical about his bounce and pace once he gets it right. You have Holder with his height and the bounce that he gets, but he is much more consistent and the movement off the wicket both ways. And then you have Alzarri Joseph who again has shown mental stability," Gray said. A veteran of 122 first class matches with 451 wickets, Gray said he is delighted to see a number of fast bowlers waiting for an opportunity to get on the team as well. Discussing the series win, Gray said there have been signs that West Indies were capable of winning a series against a top team such as England, after drawing the three-match Test series against Sri Lanka 1-1 last year. "I feel real good (about the series win). I feel that we are coming through now, (but) we have not turned the corner yet but you have seen signs. When we beat Sri Lanka here at the Queen's Park Oval just last year, you saw signs that the team was coming together. I think that Jason Holder has done a marvellous job in the way he has gone about things," Gray said. Reply to "Gray: WI pacers to be feared"